Every One Works to get wages, this is being the universal truth. But Do you know how much is the reasonable amount of money for your job? Or In other Words, What is the suitable Salary for the Specific job? India is one of the lowest salary paying countries in the world to entry-level employees. Average starting salary in India is Rs. 24,000 per month, which is less than one-fifth of what is paid in South Korea and Singapore. Have Our Government fixed the wages Correctly? How can we determine what is good wage or salary for the Specific Job? To make you understand better, we’ve compiled the salaries of different jobs in different companies at entry level and after around 5 years of experience. 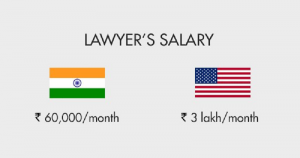 These approximate amounts reveal a stark contrast in the salaries in India and abroad, despite keeping standard of living differences in mind. This could be the main reason why there is a Brain Drain happening in India.